We collect trophies within all the borders of South Africa with our own vehicles and crews wherever practicable and also arrange for the collection of trophies from any other African State or International Destination and bring all the trophies to our 2,100 square meters warehouse, guarded on a 24/7 basis. As part of our strategy to expand our footprint in South Africa, EMIAC has recently established a collection hub for trophies in Somerset East, right in the heart of the Eastern Cape, which is one of the busiest Hunting Areas in South Africa. 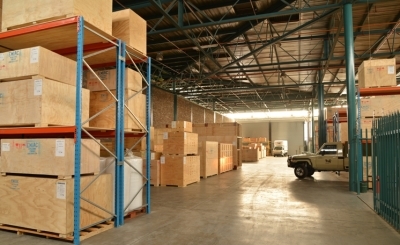 In our 300 meter square secure warehouse, we temporarily store all the consignments, before transporting full loads to our Johannesburg facility. In the meantime, in order to enable our Head Office staff to not delay the export process, all the required paperwork collected from the Taxidermists in the Eastern Cape, is couriered to our Head Office in Johannesburg on a daily basis. Exporting Sport Hunted Game Trophies from Mozambique. Whilst Mozambique remains a remote and exciting hunting destination for the true African hunter it was unfortunately notorious for its lengthy delays in getting trophies exported and delivered to hunters globally. In order to speed up the process EMIAC invested in a world class Veterinary Approved Dip & Ship facility in the heart of Mozambique. Since October 2012, we have now been able to not only control the processing quality but we are also in a position to continuously put pressure on the authorities to improve on the red tape extremes currently in place. In an effort to further speed up the process, we put in place a system whereby we frequently contact the Outfitters countrywide to make arrangements to collect their client’s trophies with our own vehicles, as soon as possible after the hunt. Once we have collected the properly tagged trophies together with all the required documentation from the Outfitter, the hunting trophies are transported direct to our facility in Chimoio for immediate processing to prevent any deterioration. Within 3 days from receipt of the trophies in Chimoio, our Mozambique Export Manager who is based at our Head office in Johannesburg will have all the Hunters contact details and trophy information on hand and will from thereon take control of the shipment until it reaches its final destination.